These rabbit cage plans will show you how to build a rabbit hutch. Rabbit cages are actually very easy to build yourself if you have a couple of tools and an hour of time. No special skills are needed! In fact, I built cages using these plans when I was ten years old. This rabbit cage plan is good for indoor or outdoor rabbits and the materials are inexpensive, I spent about $35 the last time I made one (not including tools, which I already owned). One of the greatest things about these rabbit cage plans is that the cage is all wire so your rabbit won’t be able to chew it! These cages also have great ventilation and feeders/ water bottles are super-easy to attach on. You’ll also be making a cage that has a top-opening door, which are my favorite cage style! It’s simple to take your rabbit out/ put your rabbit in when there’s a door on the top! You’ll need to buy a square tub to use as the cage base. 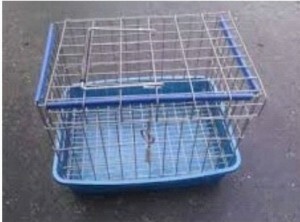 You can buy a metal one online from a rabbit-supply store (like KW Cages or Bass Equipment) or you can purchase a plastic tub from Target, Home Depot, or similar-type store. The cage base you buy (either metal or plastic tub) will determine the over-all size of your rabbit cage. The fun thing here is that you can pick what color you want this to be! 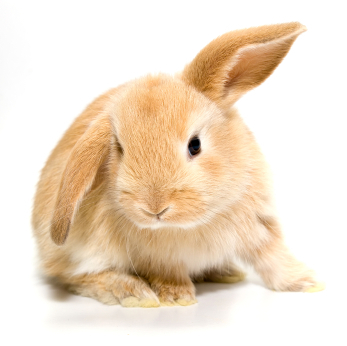 To make sure it’s big enough for your rabbit check out our rabbit cage sizes here. I always say that bigger is better so, if you’re looking at tubs pick the larger one! We offer free rabbit cage plans for bunny transport cages to everyone who joins our community by signing up for our newsletter. 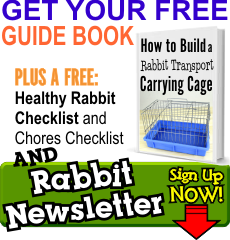 Download our How to Build a Rabbit Transport Carrying Cage plans and follow all the steps that are outlined in the PDF. You will follow the same construction method used to make the transport cage, only your cage is going to be bigger! Big enough for a rabbit to live in all the time. Once your done then your cage is ready for a bunny!